In May of 1922, A.Z. Idelsohn signed a contract with Polyphone Records in Berlin to release a series of records featuring Hebrew Palestinian folksongs (titled in German Hebraeishe Palaestin Leider). A.Z. Idelsohn selected the repertoire to be performed primarily from his collections of Hebrew song. In the end, sixteen records were released in Germany, including a total of thirty-nine songs: nineteen performed solo, and the remaining twenty performed by A.Z. Idelsohn's choir. The records were disseminated world-wide by the record companies Polyphon, Deutsche Grammophon, and Polydor (the export label for Deutsche Grammophon). 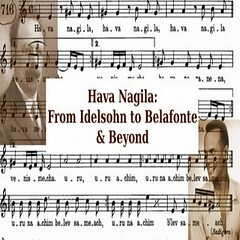 The first commercial recording of Hava Nagila was released on one of the albums in the series. Below is the recording of Hava Nagila released by Polydor, performed by A.Z. Idelsohn's choir.